Uncle Ivan performing a smoking ceremony at the swearing in of the new Campbelltown council in September 2016. The passion in Uncle Ivan Wellington’s voice is unmistakable. But if you listen very closely it goes up a notch or two when his welcome to country speeches turn to young people. “Ah, the young people, our hope, we must do everything we can to help them on their journey,’’ Uncle Ivan will usually say. One person he won’t say too much about is himself. Now and again he will mention in passing that he’s a “saltwater man from Kiama’’ but that’s about the extent of any self indulgence from this wise Indigenous elder who would not look out of place wearing the mayoral robes of Campbelltown. Ivan Wellington may have left Kiama for Campbelltown more than 30 years ago, but what the rest of us have got to understand is that as far as he is concerned he’s still in Dharawal country. Dharawal extends south from Sydney Harbour, all the way to the Shoalhaven River. But Dharawal extends inland as well, reaching Camden and Campbelltown among other settlements. So Campbelltown is as much home as Kiama was for a young Ivan Wellington, who’s descended from the Wandi Wandian people. He was born in Kiama in 1946 and loved growing up near the ocean. “It was beautiful country and everything was there for you,’’ he says. “I got a bit of schooling there, learned what I needed to learn for the journey. Honour: Uncle Ivan Wellington receiving a community service award from Mayor Paul Lake in 2015. Ivan Wellington also got married, had children and grandchildren, one of whom needed his guidance, so he packed up and came to Minto. And that was that and Ivan Wellington has been here ever since. And the Indigenous children of Campbelltown have a lot to be grateful for that Uncle Ivan decided to stay here instead of returning to Kiama all those years ago. Uncle Ivan says Indigenous kids have the same challenges as anyone else in the community. “The kids taking the wrong path, not being educated, not going to schools and all that, same issues as everyone else,’’ he said. “We can’t fix these things for good because it goes on, it’s about mentoring and the elders who have a big part to play, and men’s and women’s groups. Uncle Ivan Wellington is currently serving as the official 2018 Campbelltown elder. “I was acknowledged by the Indigenous people of Campbelltown earlier his year, I accepted the honour and I am doing it proudly,’’ he explains. He has previously served on the board of Tharawal Aboriginal Corporation, which he says plays a big role in the community, “especially in keeping the Indigenous culture alive’’. Which is more important than ever as the local Indigenous population is on the increase. The 2016 census found that there were 5,967 Aboriginal and Torres Strait Islander people living in Campbelltown or 3.8 percent of the total population. 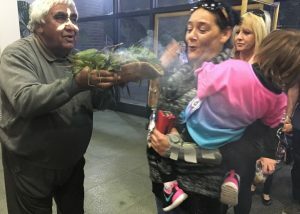 “Yes, it’s a big community, it’s growing, and becoming strong, because other Indigenous people are moving to Campbelltown, but also the ones here are families and having children,’’ says Uncle Ivan. “There’s Indigenous kids everywhere,’’ he says during our interview out the front of Leumeah High School, where he is due to take part in a late NAIDOC ceremony. 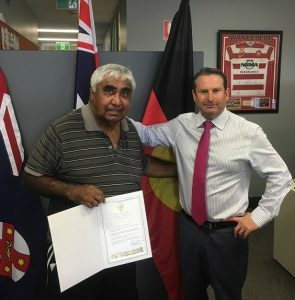 Uncle Ivan persuaded MP Greg Warren to make his Indigenous roots official. When he tells me, “Campbelltown is a big Aboriginal town’’, I ask him if they are all from tribes in Dharawal country. “This is one hell of a gift – there are 28-29 different clans here in Campbelltown,’’ he says. A lot of community work, tons of it, in schools, for council, the arts centre and so on has been Uncle Ivan’s lot in life – or journey as he calls it – since coming to Campbelltown. But you could be talking to him for an hour and he will never mention any of his good deeds, how he’s been giving and giving to this town without expecting anything in return. There has been some recognition – in 2013 the Uncle Ivan Wellington Lounge was unveiled in Campbelltown Hospital. 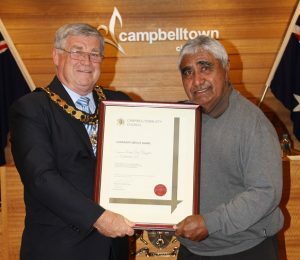 Campbelltown Council presented him with a community service award a couple of years later, and of course he is the 2018 Campbelltown Elder. “I can see there’s a lot of work here, and if I can do anything about it I’ll play my part in it,’’ he says. But most of all he loves helping Indigenous kids stay on the straight and narrow and to be proud about who they are. “I am going into a traditional ceremony now, I am a special guest here at the school,’’ Uncle Ivan says. “It’s beautiful stuff; I see the Indigenous kids and their pride about who they are – I see it in their faces and in their eyes. Draper’s wish comes true but will it inspire the Sydney Shield Eagles?